In 2017, SeeMore is making an effort to keep evolving the “Giant” line of high MOI takes on their classic headshapes with the Mini Giant Deep Flange. While the name itself is a mouthful, the goal is to offer a size/profile that is not as extreme as its Giant brethren, and through that possibly appeal to a wider range of golfers. THP was able to get the new putter in hand and spend a considerable amount of time working with it to take a look not just at the performance, but the actual science and tech that went into it. The FGP design is SeeMore’s most recognizable product, the flagship shape for the brand and the winning putter of 3 Major Championships and over 20 Tour victories. This mini Giant DF is a variation on the classic mini Giant FGP with the profile of a deeper flange. It is created using 4 sets of non-adjustable copper weights in the extreme toe and heel section as well as the perimeter of the sole, for the ultimate MOI to size ratio. Milled Aluminum head weight is 355 grams. Black Finish w/dark pearlized RST. All Putter Models Have SeeMore’s Patented RifleScope Technology (RST) Alignment System, For A True Reference Point For Perfect Alignment And Set Up On Every Putt. This putter is face balanced at impact or “balanced to plane”, meaning it’s dynamically balanced to the angle you putt and naturally returns to square at impact – less manipulation during the stroke to keep the putter face on the correct path. “Giant” is not typically a word that most golfers want to hear associated with their putter given that facet of the game being such a mental one. Bigger does indeed inspire more confidence for many, but it is a fine line to walk because it can also turn some off. The original Giant FGP putter is a great example of just that. However, when the Mini Giant Deep Flange (DF) was introduced this year by SeeMore at the PGA Show, it appeared as if the company is finding their stride when it comes to creating a high MOI design that will strike the fancy of a larger group. Most of the size with the Mini Giant DF comes not in the heel to toe, which is the same as a standard mFGP putter, but the overall width of the putter including the topline and extended flange. The name “Deep Flange” gives away the main focus of the design, and it shapes the putter into a mid-mallet look but the squared flange “frames” the golf ball for alignment more than the shallower FGP shape. Additionally, though the topline at first glance looks like its smaller sibling, it is noticeably wider. SeeMore is using a larger shaft diameter which blends it all together visually so that nothing seems out of place like a standard shaft might. The head is 100% milled out of aluminum so that the size to weight ratio can be manipulated more. In this case through the use of copper weights with two in the sole and one each in the heel/toe of the putter. While the weights are not removable, they do put the weight of the head at 355g which is in the wheelhouse of what most are accustomed to today. As with all SeeMore putters though, they can easily add weight to the putter via an internal “spud” for those looking for something heftier. Where finishing details are concerned, the Mini Giant DF possesses a maintenance free black finish, and there are two key aspects to this. First, we all know that black has a slimming effect visually and on an oversized putter that is an intelligent design decision. Second, the finish really shows off the milling patterns on the topline, face and sole of the putter, which look outstanding whether one likes the putters size or not. The face milling is the exact double pass/direction milling used in the Z-Series and definitely impacts the feel of the putter which will be discussed later. The version THP got in for review from SeeMore is the “Stealth RST” which features a blacked out look in all but the topline and a deep metallic red that has a crackle effect in the RST. It looks tremendous, but because we are all different it is good to note that upon ordering if the user wants a more traditional paint scheme, that can be accommodated. Before getting into the performance seen during review with the Mini Giant DF it is important to explain just what MOI is in putters and why so many, like SeeMore with the Giant series, are offering models with higher MOI. MOI stands for “Moment of Inertia”, and at its base this is all about resistance to twisting on off-center strikes, or in this case, putts. MOI is one of the “hot” phrases that is used today in marketing lingo but unlike some things out there, this one is merited. Why does the resistance to twisting matter? Because most of us mere mortals MISS the sweet-spot more often than we would ever care to admit, and the lower the MOI of the putter then the more directional and distance loss can be seen. By adding weight back and to the perimeter of a putter, the overall MOI can be increased, which does not increase the size of the sweet spot, but it does increase the forgiveness on putts to the perimeter of it. These things are tracked in fancy numbers and for those curious, the Mini Giant DF sits at 5,780, while not as high as some, it is considerably higher than standard SeeMore’s and most blades. Bottom line, more MOI means more balance and consistency on misses, but admittedly higher MOI putters are usually bigger in overall footprint or a rather unique shape. While the design of the Mini Giant DF has been talked about a lot so far, it truly is important to again mention the difference in size from the other “Giant” models. This is much more in line with a mid-mallet and the shape itself makes it easy to get comfortable over. During testing, it was put into the hands of several blade-only players, and though shape wise it may not have been their cup of tea, it was synonymous that it was not off putting either, given how fickle people are with their putter preferences that is a good thing. Because the putter is focused on increasing the MOI, it is no wonder that it proved to be extremely stable for a variety of different putting strokes. Added onto that, is the fact that it is also “Face Balanced at Impact”, which means that it is weighted so that it will return to square through the stroke without unnecessary manipulation, meaning more consistency at impact. A lot of work was done on the greens to test the ability of the putter to keep line and pace on misses. To do this, two tees were utilized to create a gate and then the placement of the golf ball in relation to the face was moved (heel, center, and toe). Talking about just the Mini Giant DF results would not paint the whole picture though so the same procedure was done with a SeeMore mFGP and mFGP2. Comparatively, heel side misses traveled on average 1’ to 2’ further and with 4.75” less lateral dispersion leaving them significantly closer to hole high on 5, 10, and 15 foot putts. Toe side misses found slightly less distance retention ranging from 1.5’ to 2.5’ further but with a similar left/right miss pattern of right around 5”. On center putts, the results were essentially a wash in overall distance and directional variation, as expected. What does all of this mean? Simply that the Mini Giant DF did get closer to the hole compared to the standard designs that SeeMore offers. Beyond the technological and performance traits of the putter, we cannot neglect to discuss the tactile feedback of sound/feel. Where the Giant FGP offers a more firm and sharp feedback while still being incredibly balanced through impact, the Mini Giant DF has a much more pleasant feedback despite being made of the same 100% milled aluminum material. In fact, the sound/feel off of the face is noticeably more dense, but maintains firmness so that putts across the face don’t get muddled and can be differentiated. 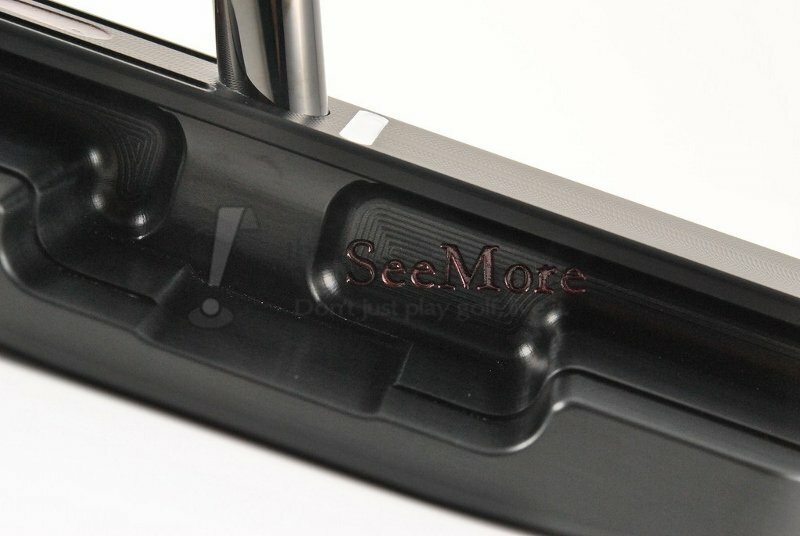 It is the opinion of this reviewer that the dual face milling SeeMore brought over from their Z-Series putters deserves a lot of the praise here for getting things “right”. Combine that with the density of the copper weights utilized in the design, and you have a High MOI putter that doesn’t sound/feel awkward, which is the opposite of most MOI based designs out there. 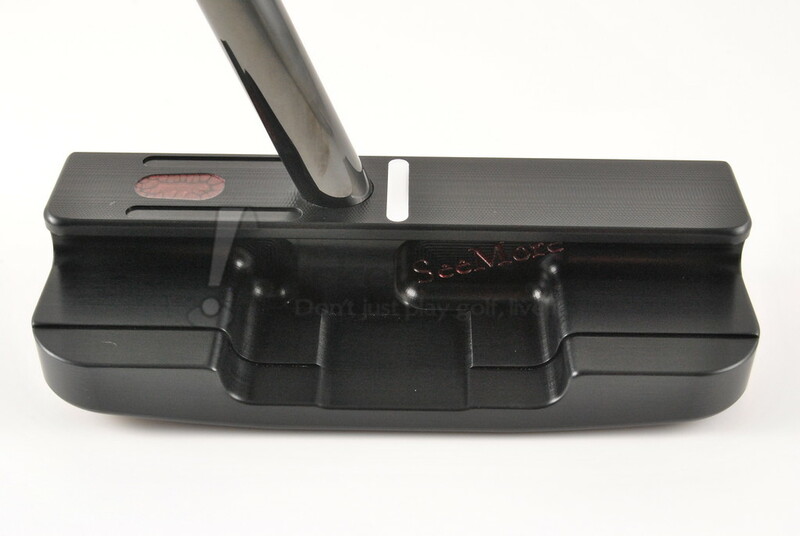 A review on performance of a SeeMore putter would be remiss to not mention the RST. Despite being “stealth” on the putter received for review, that fact does not in any way change the effectiveness of it. The RST when hidden ensures that the face angle is properly square to the chosen line and thusly totally eliminates one of the major variables in putting for most golfers. Adding to that the decision by SeeMore to utilize a Tri-Sole which allows the putter to also be soled properly each and every time you have two major issues eliminated, then mix the MOI of the putter into the equation and you have the recipe for eliminating some of the biggest putting variables that golfers battle day in and day out. Eliminating variables means more consistency, and more consistency means better putting, period. There is no doubt that the “Giant” line of putters for SeeMore is not going to be everyone’s cup of tea, and that is perfectly fine as there is no club in the bag more personal than the putter. 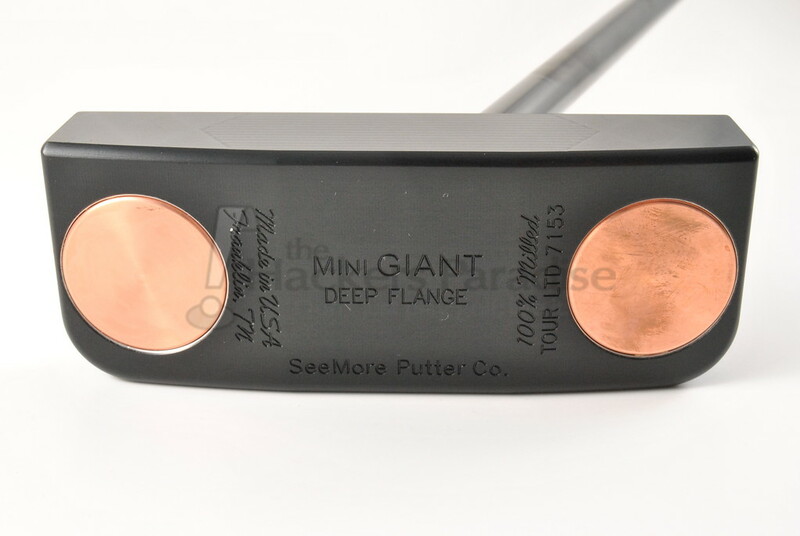 That said, the Mini Giant Deep Flange is finally an offering that bridges the gap of increased MOI but without totally sacrificing familiarity and comfort standing over the ball. The shape is much more a mid-mallet than it is a “Giant” and they definitely got the sound/feel right on this one to make it a much more accessible option for golfers. This direction is precisely where this reviewer hoped to see SeeMore take the higher MOI goals as so many of their traditional shapes can blend with it, as such, it will be interesting to see if we see more adaptations into this size profile from them down the road. 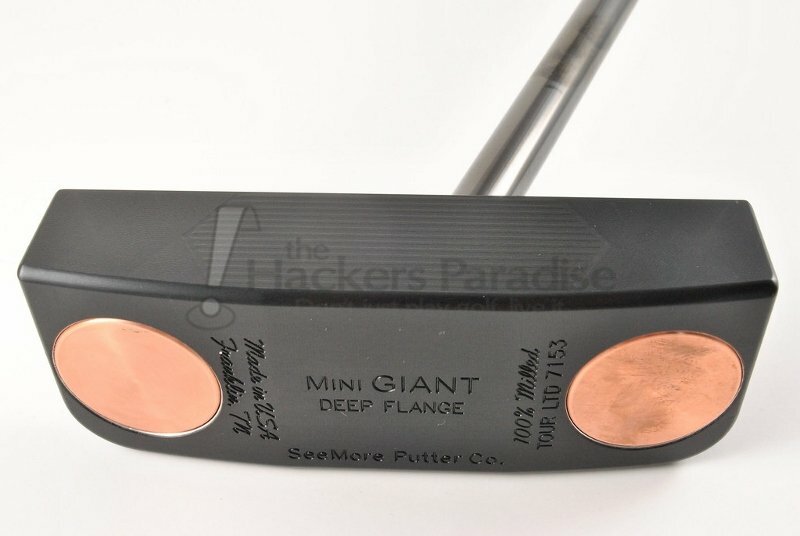 The Mini Giant Deep Flange has a price of $395.00 and more information can be found at www.SeeMore.com. Another incredible review James! Definitely a putter I would like to see in person and roll. 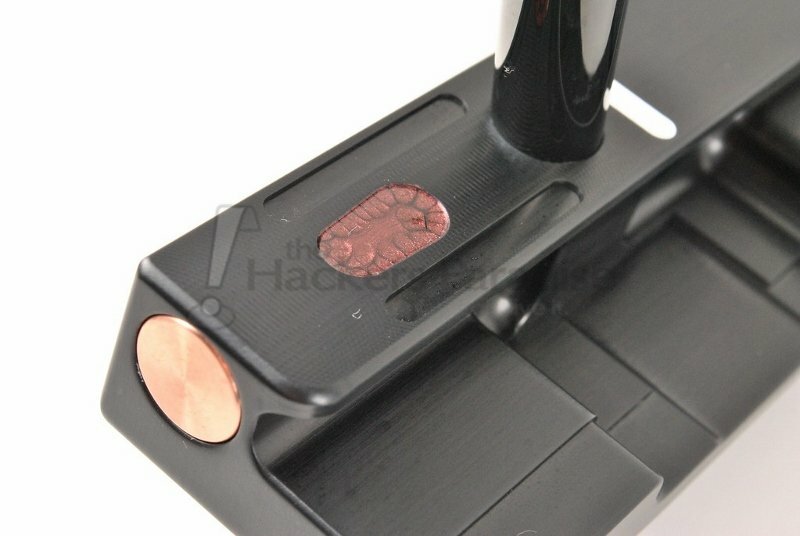 This looks like an excellent high MOI design for those who aren’t all in on the bigger putters. A very solid looking offering from SeeMore! This could be the putter that gets me back to a SeeMore. Love the look of the finish and the RST in stealth mode. This is such a good looking putter. I’ve been playing an oversized blade and the extra MOI definitely helps without the putter being enormous. This is one I definitely want to give a roll sometime. Nicely done James! I really like the testing you used for off center hits. This seems like a great SeeMore option! Jman – Fantastic work! Well done and appreciate your time and effort. Awesome review! I like the look of the SeeMore Giant – also the fact that is the width that gives it the “giant” look. Great review James! I love the direction SeeMore took with this! The fact that it has the same face width as the original FGP allows it to seem much more “mid-mallet-ish” wich should appeal to a lot more golfers. This is next on my WTB list. I do like the nod to the original SeeMore headshape but this looks like it would produce a sound I am more akin too. I want to try this one out!!! I just got my new SeeMore Mini Giant DF and like it so far.